Words: Dr Bryce Dyer (Bournemouth University). If SUP racing was a human being, then it would pretty much still be in nappies. For example, there are new styles of events springing up, whispers of Olympic Games inclusion and rapid changes and diversity in board design. And yet, with all of this happening, nothing is strictly defined, the sport’s governance is fractured or absent and everything feels up for grabs. The question is though – where will the sport go? Could it go there? And most of all, should it go there? In this article I thought I’d open up some of the hot topics in SUP racing for debate. Governance – who wants a slice of the pie? Who actually governs SUP as a competitive sport may not be relevant to most paddlers. Many of us just want to get out there and paddle, cross the odd finish line and have some banter in the car park afterwards. However, how a sport is run is integral to how it’s perceived, marketed and managed. Get it right and you create a marketable product that everyone wants to be part of and that people want to invest in. This can help create bigger events, increase visibility and help drive its technological and sociological change. However, get it wrong and you end up with multiple groups fighting for the same thing (like boxing), or be riddled with conflicts of interest and corruption (as per international football’s current woes). As SUP stands, many wish or state claim to managing its interests but these still struggle to gain traction or credibility. Many countries don’t have their own governing body which in turn can, for example, create problems such as team selection for any World Championships. We also have a situation whereby two racing board standards currently exist (14ft and 12.6ft) and as a result, the best paddlers are being diluted between two entirely different classes. Ultimately though, let’s say these issues could be resolved. There are two likely destinations that would stand to benefit a massive potential increase in membership, cash and education if adopting SUP. Considering the fact that the sport uses a board and involves open water, it would seem to lend itself to a surfing governing body to look after it. However, also consider that there is evidence that shows that stand up paddling in canoes predates surfing by hundreds of years. Plus, in the UK it has typically seen greater levels of participation over the last two years of events held on rivers, reservoirs and lakes from those of the sea. With that in mind, a canoeing body may well be a better fit. The question the sport should ask itself is whether SUP at its heart is closest to surfing with a paddle or canoeing standing up? Once you get past this, it’s then on to the hot topic of SUP and the Olympics. The Olympics – the pinnacle of sporting competition. The Olympic Games in its modern guise has been around since 1896 and is typically considered the highest pinnacle of sporting excellence. Over the last 120 odd years, new sports have been introduced, some have also long since been confined to the archives (‘tug of war’ anyone?) and every four years the event captures the public imagination. Let’s assume for a moment that the sport enters the Olympic pantheon, what then? Well, growth for one. You’d get a massive surge in interest from the millions of viewers watching the sport on their TV. More people would want to join in and others would want to be associated with it, either personally or financially. It’s worth noting that the membership of British Cycling skyrocketed since the GB track cycling gold rush of 2008. However, with any golden goose, there are risks. If it went to the Olympics, the format of any SUP racing would be limited. Other sports like athletics and swimming are part of the Olympic charter so are afforded a variety of racing types and distances. However, as new sports are adopted, there isn’t as much room to accommodate them since the total number of athletes that can compete at a games is fixed. With recent Olympic adoptions such as triathlon, only one distance format could be accommodated. Aside from the Ironman brand, the Olympic standard distance has now become the defacto racing format that the wider public generally recognises. 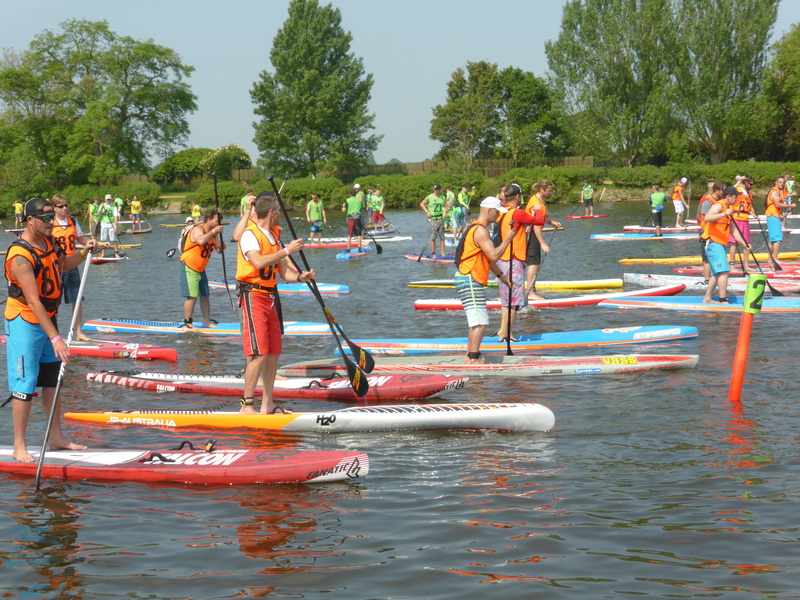 SUP already has a diverse range of race formats including everything from 200m sprinting on a Naish One to the mammoth endurance challenge of the 11 Cities Tour. Likewise you can race in the turbulent froth of the Payette River Games or hammer round the buoys at the Pacific Paddle Games. Which one should you choose to represent SUP? Defining a format that the wider public associate with may ultimately become a rod up its own back and therefore limit the creativity or interest in new racing format – and just whilst the sport is still learning to walk. Technology – progress, performance and advantages that can’t easily be undone. Finally, whilst the notion of a ‘level playing field’ is often touted around in sport, I know from professional experience that some ‘fields’ are frankly more level than others. Whilst boards, bikes or clothing might appear the same, you can buy performance. The only reason people aren’t often focusing on the tangible benefits of technology in SUP is purely that most just don’t have the tools, the methods or the motivation to measure it. Bear in mind though that SUP paddlers are trying to paddle through a liquid that is approximately 784 times denser than air. If you take this into account, it becomes glaringly obvious that for flatwater paddling at least, hydrodynamic drag is something a paddler really needs to be concerned with if they want to go their fastest. Buy a better board and you’ll go faster for the same effort or maintain the same speed you had for less. Sadly though, the best board for any paddler is likely to be a unique choice based upon their stance, paddling style, race conditions, weight and actual ability. Telling anyone what is optimal is either too hard to predict without data or at best, an educated guess. For example, any craft moving through water will have its performance influenced by what is known as its ‘Froude number’. To oversimplify, this value dictates a craft’s hydrodynamic ability based upon a ratio of its overall length to its width. There are optimum values based on the speed a paddler would typically be racing at and this is likely narrower than the 25-30 inch wide boards that many of us are currently racing on. Narrower is generally faster and top UK paddlers such as Aaron Rowe or Jo Hamilton Vale are now experimenting with boards that are going narrower than 24 inches in width. The danger of this is that the sport may lose its inclusivity as it evolves for many to become something of a balancing contest. The grassroots, novice or larger competitive paddler may not have any interest in a sport when the learning curve becomes too steep or the distance to their role models too far away. These concerns may well be part of the appeal for some of the large fields seen in the Naish One N1sco races in the UK this year. In academic terms, we can often judge a technology’s merits based upon how it influences participation, whether it deskills or reskills a sport, affects safety or changes its costs. The question for SUP is establishing equipment rules that at least consider these openly before it’s too late. For example, by the time full length bodysuits were outlawed in swimming, they had already been in use and debated for nearly a decade. Athletes in the future will now have to try and surpass records set by their predecessors whilst at a competitive disadvantage. All in all, SUP has a lot to think about. However, it’s come a long way in a relatively short space of time and it’s a credit to its popularity and appeal that it’s even having such discussions in the first place. It does make you think though where we’ll all be in 5-10 years’ time.